Together with frequent contributor Abdal Hakim Murad LastProphet.info is honoured to present a short clip from the recording of a mawlid performance filmed at the Fatih mosque in the city of Durrës, Albania. The mawlid is sung in Albanian from a translation written by Hafiz Ali Ulqinaku in 1873 of Suleiman Chelebi’s famous 15th century mawlid. Hafiz Ulqinaku was an extraordinary figure whose talent and scope seems endless. He was a poet, politician, educator, scholar, imam, mufti and soldier. Ulqinaku’s translation plays beautifully with the eclectic Albanian language - adapting and even adding new verses - to create what is arguably a work of art in itself. The mawlid became a critical vehicle for preserving the Muslim identity of Albanians and the Albanian language from Slavic influence, and to this day is renowned and recited in the Albanian diaspora, particularly in America and Australia. It is sung with a specific maqam or modal melody which has as its basis the traditional melody of the folksongs of the northern part of Albania. The full 47-minute recording can be purchased here for $5.00. Proceeds from the film will go towards the Cambridge New Mosque Project. Thank you for your support for the Cambridge New Mosque Project. This recording is a gift to our Project by a group of students of traditional sacred knowledge in the noble Muslim land of Albania. We are proud to present this recording, which gives a unique insight into a purely traditional scene of Balkan mosque life, with English subtitles taken in part from the translation by E.J.W. Gibb of the Mawlid of Süleiman Çelebi, may Allah’s mercy rest upon him. 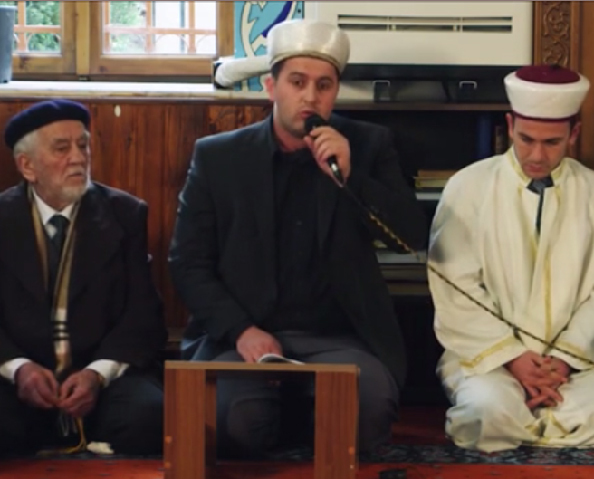 The singers include many from the very old generation who learned and loved the Mawlid publicly before the official prohibition of religion in Albania by the atheist regime of Enver Hoxha in 1967, and secretly after that time. Between 1967 and 1992, scholars were mocked, tortured and imprisoned for their lack of belief in atheism. The country’s mosques were closed and most were destroyed. Under a law of 1976, failure to accept atheism carried an automatic ten-year prison sentence. Many ulema were killed; among the martyrs we remember Albania’s grand mufti, Hafiz Ibrahim Dibra, and mufti of Durrës Mustafa Efendi Varoshi, and hundreds of others.